5788 6K Vukovar overprint 1944, admission stamp rouletted with inverted overprint \"island post\", fresh colors and mint never hinged with insignificant paint adhesion withdrawals above of the right eagle wings. Photo expertize Petry BPP. 5789 8A Rhodes island postage stamps perforated, wonderful fresh colors and outstanding perforated, unused, gum not original, with horizontal black local overprint \"island post\". One of the great island post rarities, the in almost all collections is absent. Photo expertize Petry BPP. Michel for mint never hinged 15000,- €. 5790 ⊙ 8A Air fieldpost admission stamp 1945 with overprint \"island post\" the island Rhodes, perforated, wonderful fresh colors and especially nice centric cancellation with mute two circle bridge cancel \"2.12.44. \" from the Vienna area. These so-called \"on the way cancellations\" originated, if covers without permission crews of and aircraft or transported away Wehrmacht menber direct given to were. 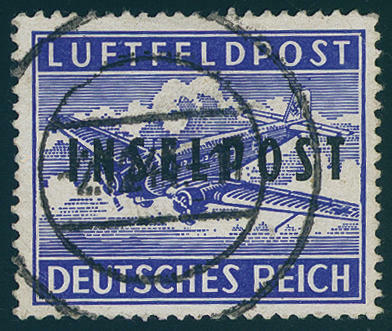 The stamp belonged original to a cover, which with the island post flight 4 at night from 30. November to the 1. 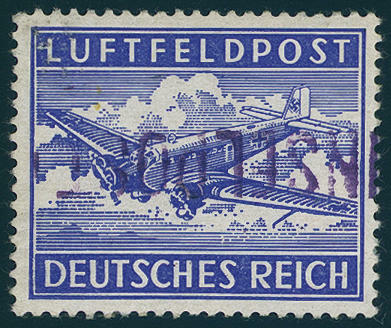 December 1944 on the main-land flown was. Mute cancellations from the Vienna area are on of this rare issue hardly to find, especially not in this first class quality! Photo expertize Petry BPP. 5791 ✉ 8A Island Rhodes, island post admission stamp perforated with overprint \"island post\", fresh colors in excellent condition on air fieldpost cover with clear single circle postmark \"army postal service b 24.1.45. 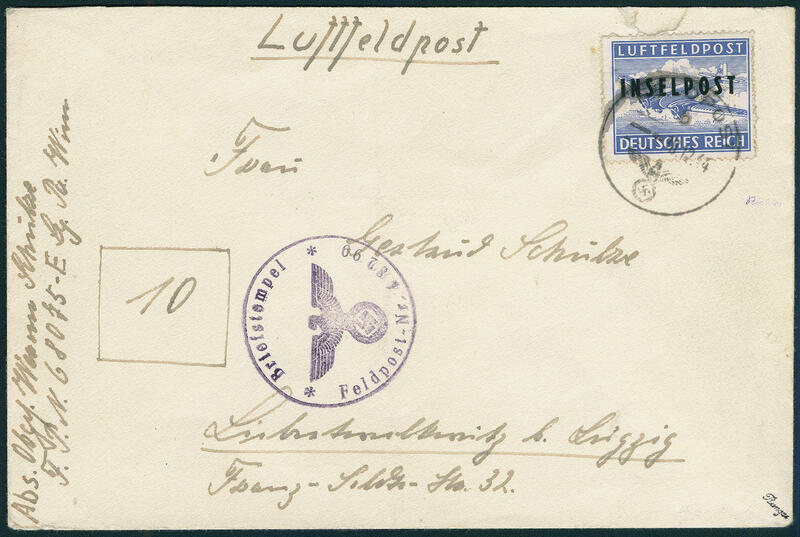 \" of the fieldpost office in Rodi on Rhodes to Rathenow. 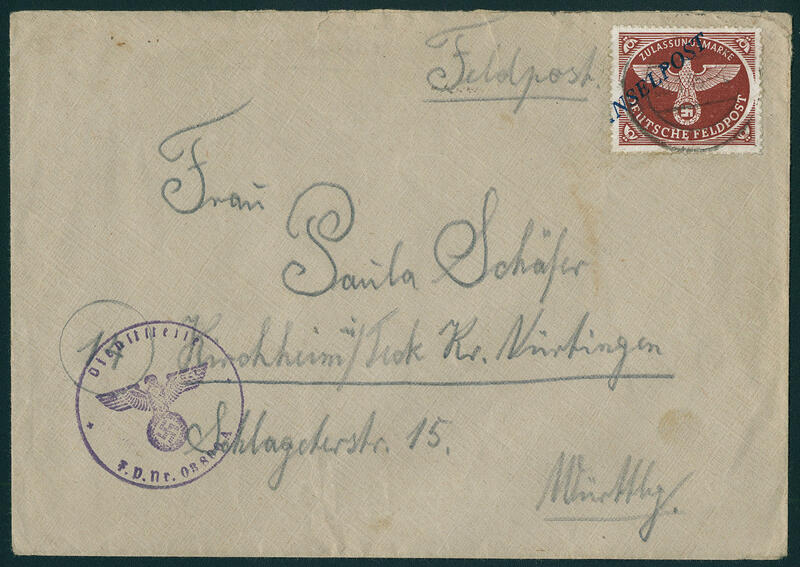 The sender adress was demonstrable member of the Rod artillery-department south with the fieldpost number 68069 A on Rhodes. Perfectly examples of this rare issue are on cover only in very few copies have become known. A top piece of this area! Photo expertize Petry BPP. 5792 ✉ 8A Island Rhodes, air fieldpost admission stamp perforated, fresh colors with minimal corner crease traces and slightly toned tips of the teeth on a little splotchy fieldpost letter, sender adress and addressee name from reasons of discretion defaced, with single circle postmark \"army postal service 10.12.44. 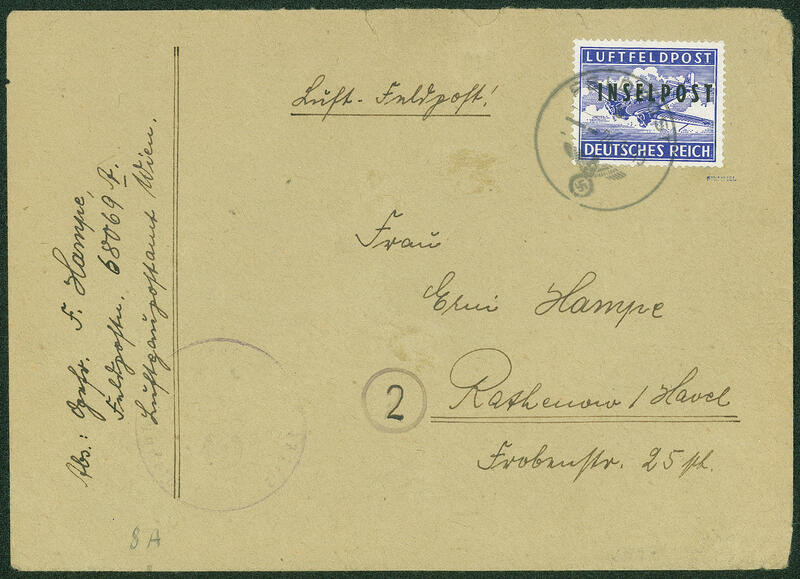 \" of the fieldpost office in Rodi on Rhodes to Kaiserslautern, cover left slightly shortened. A very scarce issue! Photo expertize Müller BPP. Michel 7000,- €. 5793 ✉ 8BII Island Rhodes, field postal service airmail stamp rouletted, above a little irregular, bold face type overprint, fresh colors on attractive air fieldpost letter with single circle postmark \"island post b 19.12.44. 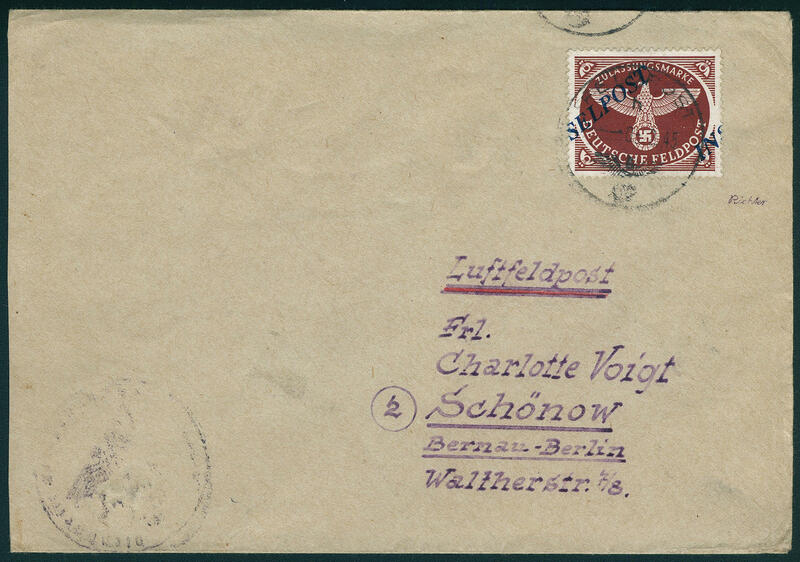 \" to Germany with violet letter cancel \"army postal service number. 48299. \" from the time before adaptation. The sender adress was member the 2. Autocar company, Divisions supplies militaries 999 with the army postal service no. 68075 E on Rhodes. Photo expertize Müller BPP. 5794 ✉ 8BII Island Rhodes, air fieldpost admission stamp rouletted, bold face type overprint, very nice right lower corner of the sheet, a few piercing tongues slightly shaded, on fieldpost letter with single circle postmark \"army postal service 14.2.45. \" and additional seal of office to Itzehoe, cover slight traces of usage. 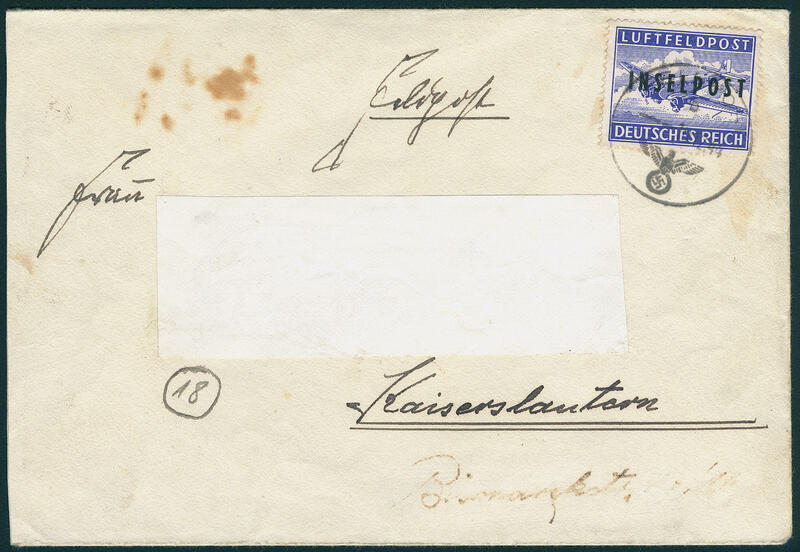 Corners of the sheet of this issue are on cover extraordinarily rare! Photo expertize Petry BPP. 5795 10AbII Agramer overprint 1944 perforated, admission stamp with dark blue overprint, admission stamp with dark blue overprint \"island post\", fresh colors and in perfect condition mint never hinged, photo expertize Petry BPP. 5796 ✉ 10AbII Agramer overprint in dark blue, plate II, perforated, fresh colors and in perfect condition on very nice air fieldpost letter with single circle postmark \"island post 5.2.45. 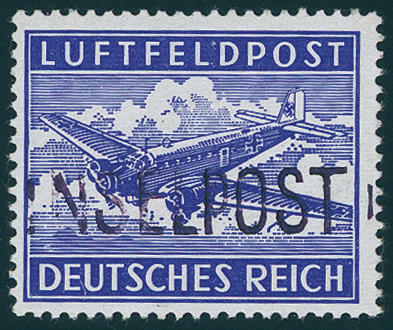 \" from branch field post office on Leros and probable with the island post flight 12 over the island Crete at the 4. 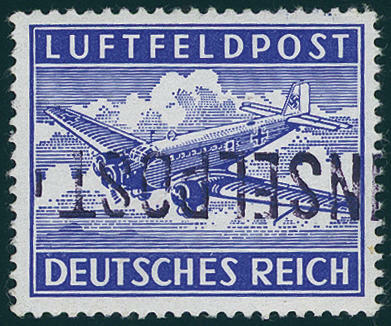 March 1945 to the main-land flown, to Schönow. 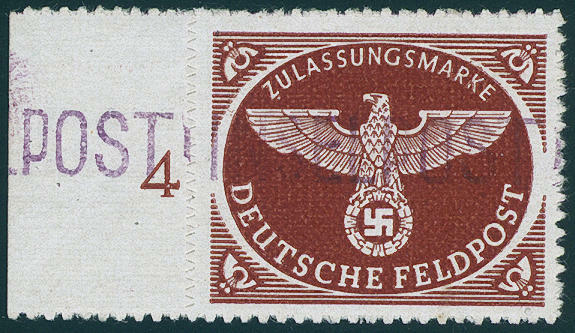 Besides is the overprint strong to the right shifted and through it divided. So strength moved printings come by the island postage stamps hardly once before and are especially on commercially used letters extraordinarily rare! Photo expertize cheater BPP. 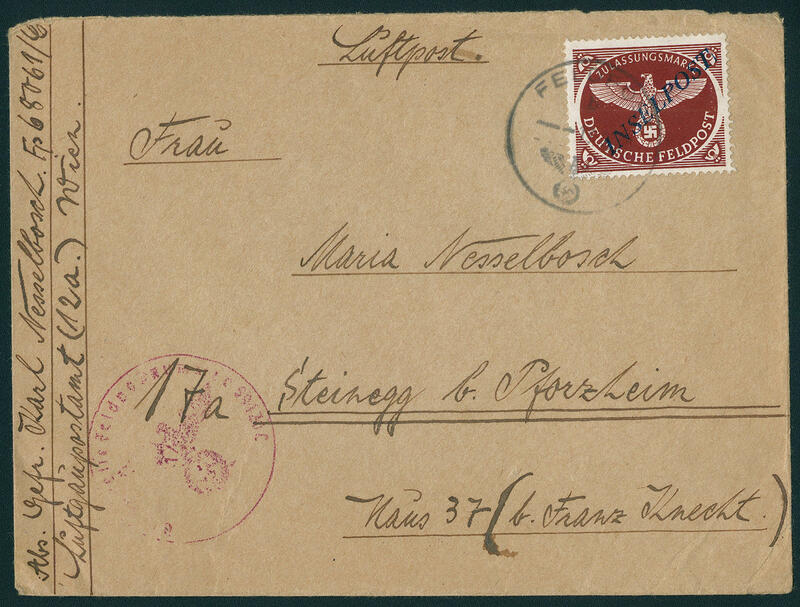 5797 ✉ 10AbII Agramer overprint, perforated, fresh colors on very nice late used over roller fieldpost letter with fieldpost cancel of the fieldpost office in Rodi on Rhodes from 13.2.45 to Steinegg by Pforzheim with notice of receipt from 1946. The sender adress was member the 2. Company tank battalion Rhodes with the fieldpost number 68061 C. The Agramer overprint perforated is on covers anyway rare, especially in this good quality. 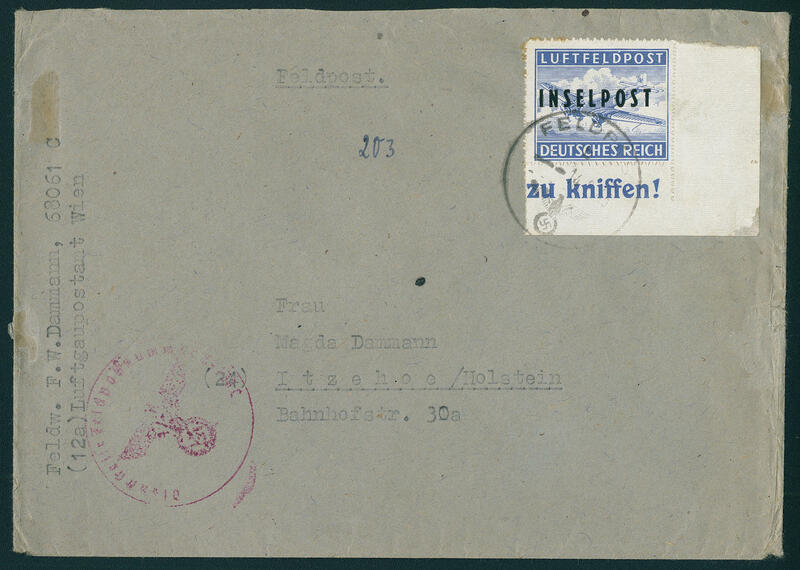 By this rollover letter, which first long to end of the War delivered was, is a rarity of the German army postal service. Photo expertize Petry BPP. 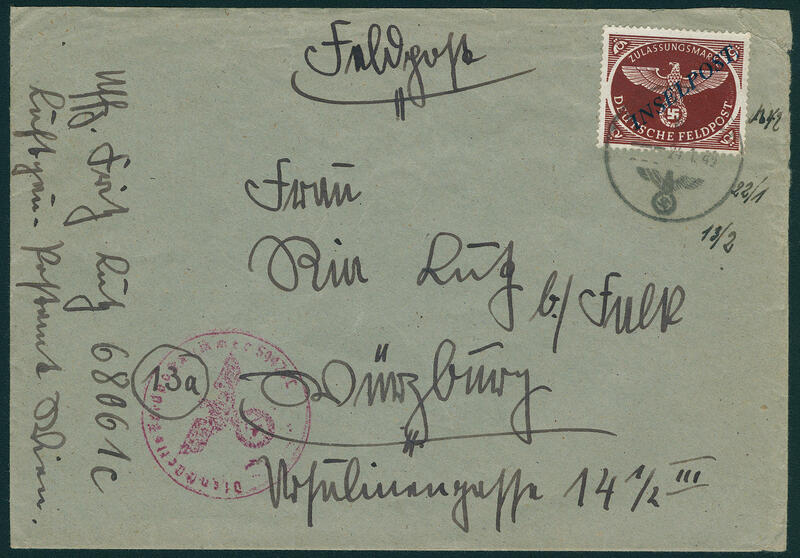 5798 ✉ 10AbII Agramer overprint 1944, perforated, overprint dark blue, fresh colors on fieldpost letter, cover right above a little rough opened, with single circle postmark \"army postal service 24.1.45. \", sender number 68061 C (Rhodes) with red letter cancel no. 59420 (old fieldpost number) to Würzburg, expertized cheater BPP. Michel 1200,- €. 5799 ∆ 10Ad Agramer overprint in rare colour black blue, perforated, wonderful fresh colors, very well perforated, tiny light and all slight trace of creases top right (practically insignificant) on attractive letter piece, removed for quality control, with clear single circle postmark \"army postal service 21.2.45\". 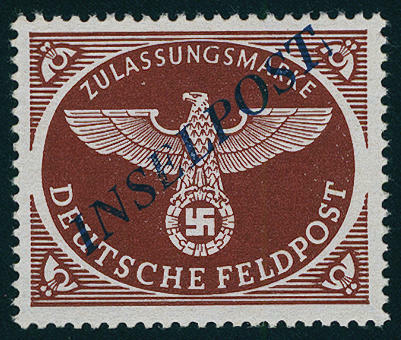 These stamp is extraordinarily rare and is absent in almost all collections. Photo expertize Petry BPP. Michel 2200,- €. 5800 ∆ 10Ad I/1 Agramer overprint 1944, island post admission stamp perforated with the extremely rarely black blue overprint \"island post\", wonderful fresh colors and very well perforated on piece with special cancellation \"PODERSAM 26.3.45\", a large island post rarity in utterly perfect condition, photo expertize Petry BPP. 5801 ✉ 10BbI Agramer overprint, admission stamp rouletted with left displaced overprint \"island post\", the stamp a little wrinkled and cover with as usual traces of usage. The fieldpost letter was not per airplane transported but rather toward the determinations the Genevan convention the hospital ship \"GRADISCA\" given to. 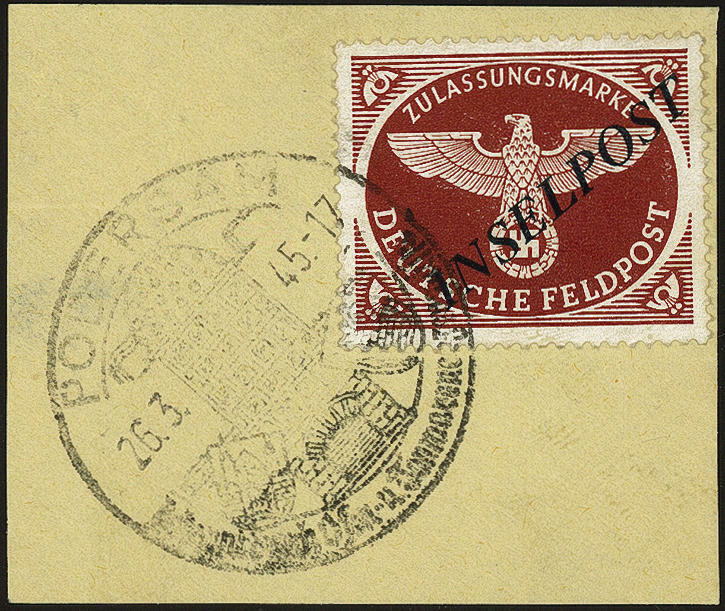 The stamp was at the landig port of the ship in \"TRIEST 30.1.45\" cancelled and the cover to Wuerttemberg forwards. Sender adress was a member of the IV. State artillery-regiment 999 on the island Rhodes with the fieldpost number 68066 B. 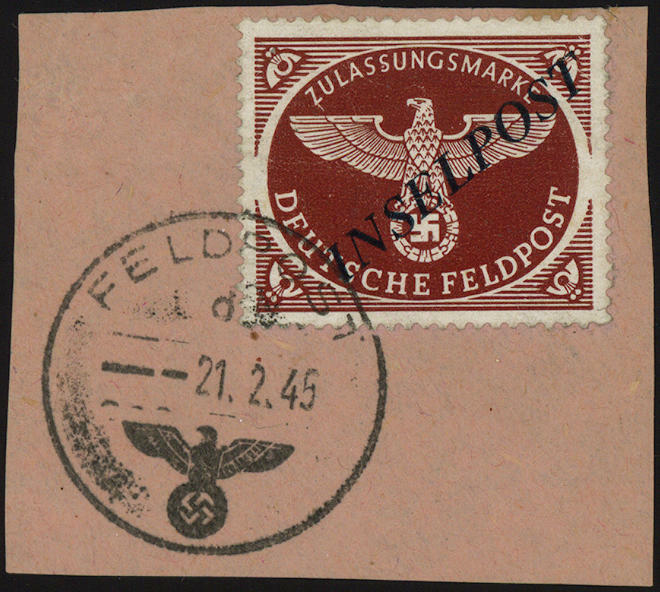 In the letter cancel appears still the old fieldpost number 03800 A. There are only few island post letters have become known, the with this hospital ship were transported. Photo expertize Müller BPP. 5802 11Aa Island Leros perforated, overprint black blue violet, wonderful fresh colors and very well perforated, in perfect condition mint never hinged, expertized Pickenpack with photo certificate. 5803 11AaKIV Island Leros, field postal service airmail stamp perforated with inverted overprint \"island post\" in black blue violet, type IV, fresh colors, two weak gumming slight creases and pressure traces are nearly meaningless. An attractive copy this extraordinarily rarely variety! Photo expertize Petry BPP. 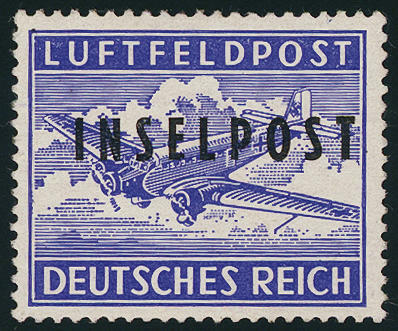 5804 11AbKIV Air fieldpost admission stamp 1945 with inverted, pinkish hand-roller cancel overprint \"island post\" the island Leros, fresh colors, unused, tiny faults. 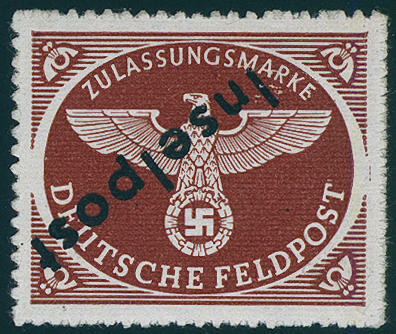 These variety belongs to the large rarities the fieldpost stamps. There are very few examples from this known. By Michel catalogue clearly undervalued! Photo expertize Petry BPP. 5805 11FPBb Field post parcel admission stamp rouletted with pinkish hand-roller cancel overprint from Leros from left margin of sheet, fresh colors and in perfect condition mint never hinged besides the air fieldpost stamps were also approximate 60 small package stamps with the provisionally Leros local overprint provided. A smaller part hereof got the light violet overprint. There are only few examples from this known, whereby it be here about an exception copy for the highest standards act. By Michel catalogue fully undervalued. Expertized Pickenpack, Rungas BPP and photo expertize \"perfect quality\" Petry BPP. 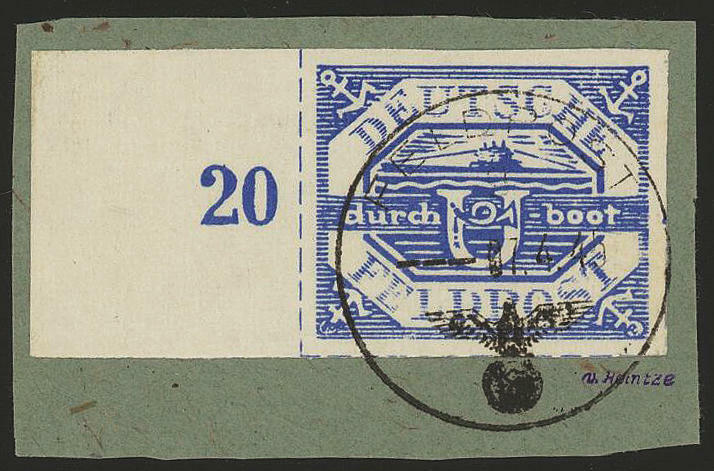 5806 ∆ 13b U boat Hela, army postal service admission stamp in blue, wonderful fresh colors and large margins all around with complete left margin of sheet on very nice letter piece, genuine and date-appropriate neat cancelled \"army postal service 7.4.45. \". A dreamlike nice outstanding quality this army postal service rarity! Photo expertize Pickenpack and newest photo expertize Gabisch BPP. 5807 14I Kuban admission stamp 1943, type I, wonderful having bright colors outstanding quality in original size, as issued on ungummed paper. An especially nice copy this army postal service rarity for the highest standards! Photo expertize \"the condition is perfect\" Zirath BPP.